Closer integration of products has led to a need for linear motion solutions that offer high speed without compromising rigidity, torsional resistance or life. 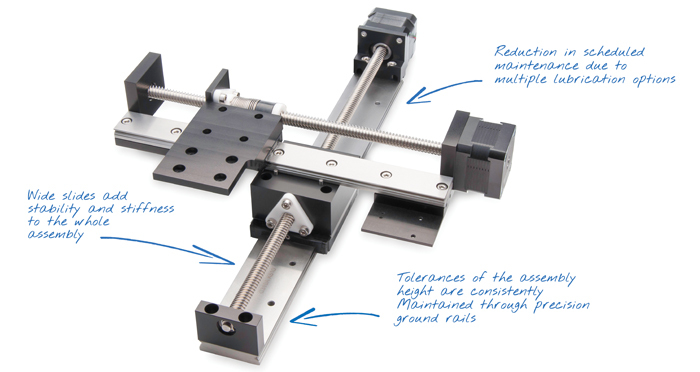 Reliance Precision’s range of linear guides are designed for high load, high moment applications and this is made possible due to a unique re-circulating ball design in the carriage which delivers smooth motion, low noise and high accuracy. The guides provide high levels of stiffness to enable the carriage to operate at higher speeds. Forty five degree contact angles and a gothic profile design incorporated into the carriage result in a multi-direction equalisation of force. The linear guides consist of a stainless steel rail and built-in lubrication reservoirs to provide an effective, low maintenance solution. Specially designed seals prevent dust and foreign objects from entering the system. Design engineers can integrate linear guides within higher level assemblies and Reliance Precision has successfully developed a motorised anti-backlash X-Y stage with a positional accuracy of 0.01 mm, unloaded repeatability of 0.005 mm and a load capacity of 50 N. Selected from Reliance’s comprehensive catalogue of components, the assembly utilised extra wide slides to cater for moment loads. Internal screw motors and anti-backlash leadscrews provided accurate positional repeatability. Linear guides are available with 3 mm to 42 mm wide rails and lengths up to 1000 mm. Offered in standard sizes or custom lengths, carriages are available in a variety of widths and lengths. Options are available for both lubrication and seals, with different mounting options accommodated via tapped or counter-bored holes. Where additional stiffness and precision is required, pre-loading of the bearings is possible. Reliance linear guides offer excellent price and performance; all guides are inspected and tested for quality assurance and a cut-to-length capability means customers can order small quantities and samples for product trials and prototyping.